These mobile units were built mainly by Marconi or Pye, and comprised several camera channels, with associated pulse generators, vision mixer and sound control facilities. At this time there was no means of recording on site, the output being sent back to BBC studios by special co-axial lines rented from the Post Office, or microwave link. As videotape technology became available, a separate vehicle was used which contained the VTR facilities. For anyone unfamiliar with broadcast TV practice, the operation of television equipment was a very highly specialised skilled area which required a large number of (mostly engineering based) staff. The TV camera that we are all familiar with was not a self contained unit, it was merely the 'head', containing the least amount of electronics necessary to limit size and weight. The camera operator does not have control of the electronic functions, but is concerned with the framing, focussing and artistic composition of the shot. The control of the lens iris, black level, gain and other parameters was the province of the Vision Control engineer, and (in the BBC) an Engineering Manager, who was responsible for the lighting and the co-ordination of multi-camera installations. 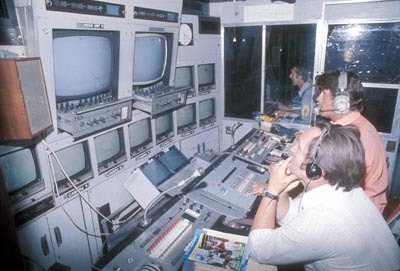 The control of the programme content was entirely separate from the engineering side, and the switching of camera sources, telecine or remote feeds on the vision mixing panel was performed by either the programme director or a vision mixer. Normally the director, production assistant and vision mixer along with specialised operators for caption generators etc. were in the Production Control area, which was a separate room in a studio, although not always in an OB vehicle. The sound side of television, which is of course just as important as the vision, was under the control of the Sound Supervisor, who would normally operate the sound mixing desk. Other members of the sound department would install and operate microphones, operate booms and also use tape recording machines. The sound department were also responsible for the communications facilities, which included many wired and radio talkback circuits, from all departments to operators, and also feeds of programme sound to monitors. The Sound Control area is always separate, as it requires acoustical insulation from the production and engineering areas. 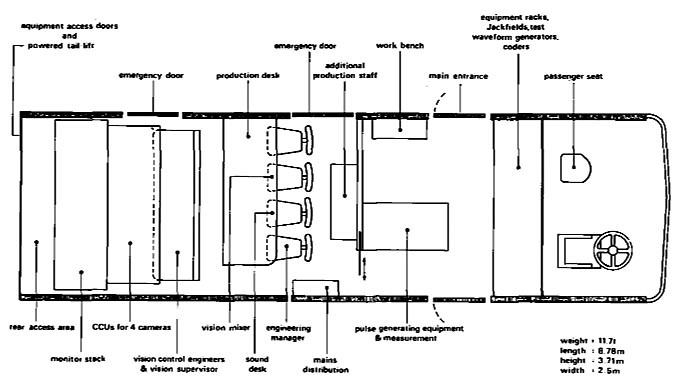 A Mobile Control Room therefore had to contain a Sound Control Room, Production Control Room, and Vision Control area. 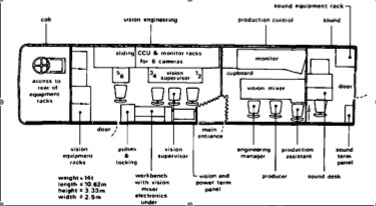 In some cases the Vision Engineers were positioned lower down, under the viewing line of the production staff, in the same area. Another area could be designated the Vision Apparatus or Central Apparatus Room, following studio practice. Even without actual breakdowns, which were common, engineers had to be on hand during productions to make adjustments and set up facilities to meet production requirements. The logistics of rigging cameras on different types of supports such as dollies, cranes etc, to change zoom lenses or extend unwieldy cables required a team of people to accomplish, so careful planning was needed, requiring site meetings and detailed scheduling of equipment and staff. 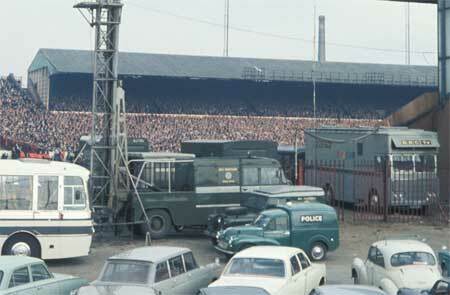 With the introduction of colour in the early 1960s, the amount and size of equipment needed increased. The camera channels in particular became more complex, and care was needed to ensure that temperatures were maintained as constant as possible to prevent drifting of delicate adjustments. For instance, an hour was required for line-up adjustments before each day's work, and these would usually need to be corrected during the day. 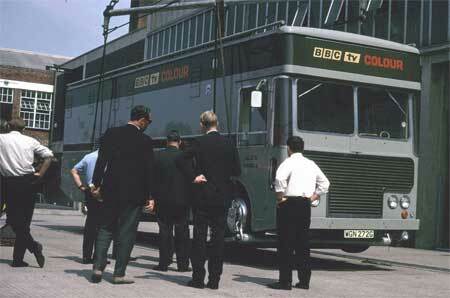 The first BBC colour mobile control room- cmcr1, 1967. 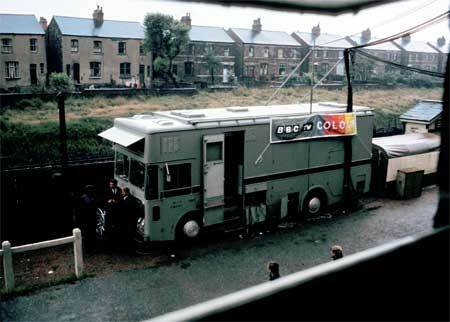 The first three Colour Mobile Control Rooms (CMCRs) were designed and built by the BBC for the inauguration of colour in 1967. They were used for the first scheduled public colour broadcast, the tennis championships from Wimbledon. CMCRS 1 to 3 were built using Albion Clydesdale chassis. They were similar to the previous MCRs in that the operators sat across the vehicle, and all the equipment was built into sub-racks which were designed to be de-rigged from the vehicle and taken into locations such as theatres etc. This was facilitated by the whole production monitor racks being arranged to slide out of the back of the vehicle on a powered tail lift. This seemed like a good idea but in practice it was a hugely time consuming task and did nothing for the precarious reliability of the equipment. 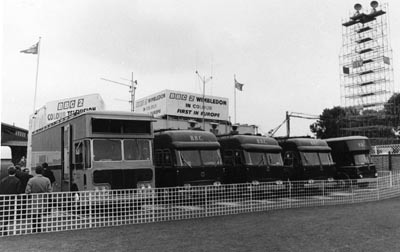 The de-rig concept was retained for the Type 2 series but was not actually used, so later designs did not include this facility.They were equipped with four Philips LDK3 cameras, but due to the BBC's 'Buy British' policy they were bought from 'Peto Scott', who were the UK agents for Philips. Later cameras were branded Pye, who were commercially involved with Philips. The UK designation of these cameras was PC60, and they used two standard MklV camera cables, which the BBC had in abundance, as there were too many connections required between head and control unit. Later the G101 cable used for the EMI and Marconi colour cameras became standard, and the Pye PC80s used in some Type 2 CMCRs were fitted with these. The Type 1 incorporated sync pulse and test signal generators, a vision mixer which was a modified monochrome unit, and was designed to be capable of operating on either 625 PAL or 525 NTSC standards. Very little seems to have survived about the Type 1 scanners, which were historically important. Even photographs of them are rare. Do you have any pictures, memories or information relating to them? Very few people had colour TVs at this time. Another atmospheric shot of C3 at Leeds. Note the 'Eagle' tower on Bedford RL. Plans were made during 1968 for the next generation of colour units, drawing on the experience gained with the Type 1s. The contract was given to Pye of Cambridge to build 9 units, all on similar Albion chassis, but this time using the longest wheelbase chassis available, the Clydesdale CD21XLB with Leyland 400 diesel engines. The equipment was to comprise 4 colour channels with an optional further 2 which could be rigged on wheeled sub-rack units when needed. The first three were to be fitted with EMI 2001 channels, then three were built with Philips/Pye PC80s. The remaining three used EMI 2001s. 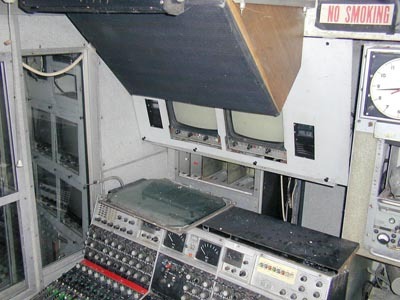 The sound mixer was now in a separate room with a sliding door to the production area, and the facilities included a Pye 24 channel mixer with compressors and reverb facilities, Studer A62 tape recorder, and an ident cart machine. There were comprehensive facilities for communications, and the sound facilities were powered from large batteries, so that in the event of even total mains failure the programme could be maintained in sound only. The Type 2 was essentially a very successful concept, and the fleet remained in daily use until well into the 1980s, when they were replaced by the Type 5. The original design was quite flexible, most of the time being used with four cameras, but extra channels could be added if the production requirements demanded it. 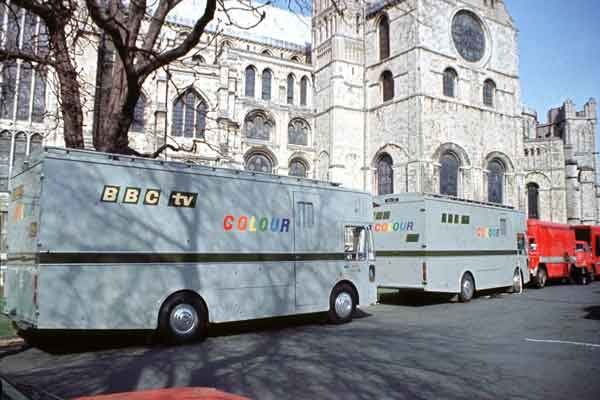 The standard complement of facilities for a BBC outside broadcast was a Mobile Control Room, a camera van which carried the camera heads, sound cables and equipment and smaller portable equipment including a black and white caption scanner for reproducing logos or written captions (Letraset on black card.) Another articulated vehicle carried all the camera and other heavy cables on steel drums, mountings such as tripods or dollies and other equipment. In addition, there might be a radio links vehicle, an 'Eagle' tower (mobile crane supporting a microwave link dish) and possibly a mobile VT unit. There would also be a generator truck- maybe two if there was a heavy lighting load. That might mean up to eight HGVs travelling to the location, plus crew! The production area had two colour monitors and at least nine monochrome monitors, the engineering area being fitted with three colour monitors and four or six monochrome units depending on the number of camera channels. Each channel also had a waveform monitor. Two monochrome monitors were fitted in the sound control room. The monitors were made by Pye, but the colour monitors were found to be very unreliable. They were of hybrid (valve/transistor) design, and did not incorporate decoders, which were fitted in the racks to supply the composite signals. They were later replaced by Prowest monitors. We know about CMCR9, North 3, but there were initially nine, plus another (CMCR13) which was used a 'demonstrator' by Pye and then bought by the BBC. It had extra aircon and was thought to have been shipped abroad. C4 being weighed at Kendal Avenue before being shipped abroad for an OB. CMCR4 (LO4) was stripped of it's equipment which was installed in the Greenwood Theatre in London. 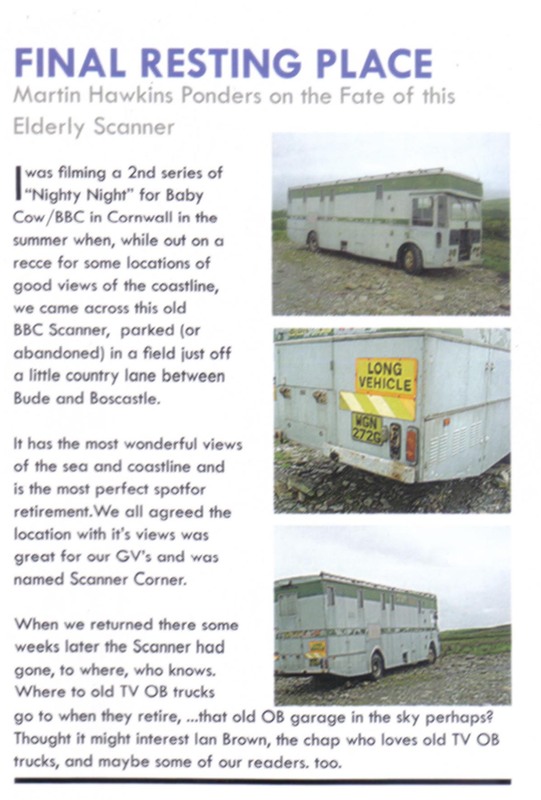 The vehicle was sold off, and and at one time was a mobile bicycle repair workshop in the West Country. It was in a field for some years in a poor state but is no longer there- scrapped? We have some of the rack units as spares, as at one time it was in the same ownership as CMCR9. See a magazine article from several years ago about a sighting of C4. It was seen in action in a BBC film called 'To Salute The Queen'. shown here with the Type 2. CMCR10 (LO6) is in the Science Museum stores at Wroughton, as part of the National Media Museum collection. 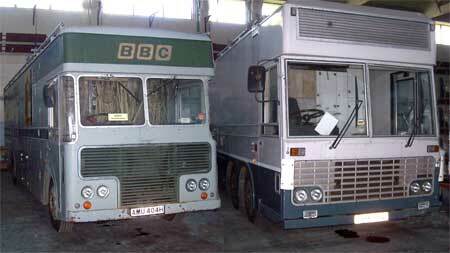 It was used as a temporary control room at BBC Leeds during the 1980s and then donated to the museum. It is not available to be viewed by the public, although it was installed at Bradford for a while where it could be viewed. 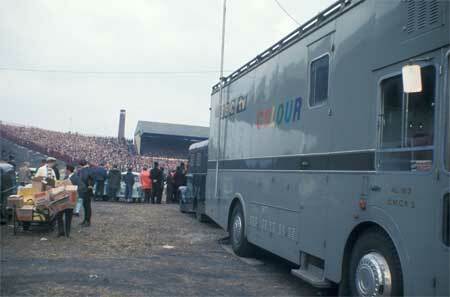 Quite a few modifications had been made to it while at Leeds but it still has its EMI camera channels. 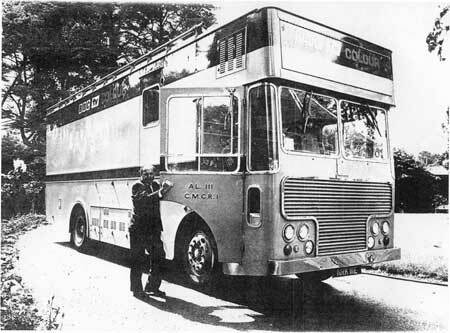 CMCR7 (N1) was sold to Cumbria Education Authority, for use in a training college, it was later sold to an artist and film historian who intended to convert it into a mobile cinema projection unit. This never happened and it lay in the open near Rye for about 28 years becoming derelict. We bought the electronics including cameras and sound equipment and stripped it out in 2007. Some of the equipment is being used in the restoration of C9. CMCR8 (North 2) was the other Pye PC80 equipped scanner. It was based at Manchester from new, and was decommissioned in 1982. It was used on the live climb at Glencoe. 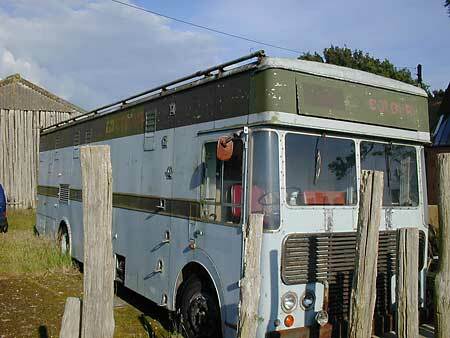 It was sold, but the buyer did not pay and it was 'snatched back' by the BBC transport department. Does anyone know of the fate of any more of the fleet? There is a line drawing in a book on Circus vehicles which appears to be a Type 2 in a circus livery- has anyone any more information?